Gwalior Fort is an 8th-century hill fort near Gwalior, Madhya Pradesh, central India. The fort consists of a defensive structure and two main palaces, Gurjari Mahal and Man Mandir, built by Man Singh Tomar. The fort has been controlled by a number of different rulers in its history. The Gurjari Mahal palace was built for Queen Mrignayani. It is now an archaeological museum. The oldest record of "zero" in the world was found in a small temple, which is located on the way to the top. The inscription is around 1500 years old. 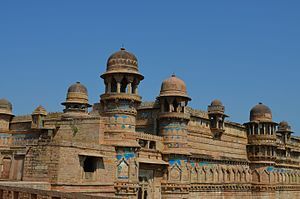 This article uses material from the Wikipedia article "Gwalior Fort", which is released under the Creative Commons Attribution-Share-Alike 3.0 License.